Brass players!---check out this CD!! It's called "New York" (with repeat signs, for the song! 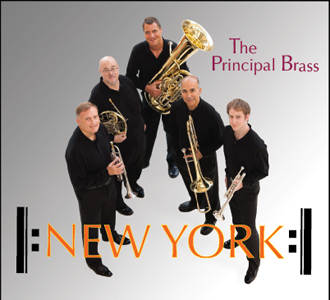 ), and is the debut CD of the Principal Brass, the principal players of the New York Philharmonic. I am thrilled to have nine of my arrangements/compositions featured on this recording. Roger Miller's 1960s pop/country classic is perfect for free-wheeling brass....snap you fingers! This trad jazz anthem has a compact melody and catchy syncopation. Erroll Garner's signature hit from the 1960s. The quintessential melancholy love song standard. written high D at the end, in trpt 1). the Jewish winter holiday. Bring a special, unusual flair to your holiday program! then closes the the latin feel..
Work Songs with a brass quintet...it just feels right! "Erie Canal", "Ballad of John Henry" and "I've Been Working On the Railroad"
43. Ravel String Quartet, 2nd Mvmt. The pizzicato translates brilliantly to a crisp brass sound. A #1 Billboard hit song in 1972, this beautiful song still resonates. It just makes you feel good, and really rings out with brass! how universal is the music of Mozart!. Any Stevie Wonder tune is a joy to arrange.... Nothin' fancy.....just knock out the funky latin rhythm on this one! rich tradition of patriotic music. This tune was irresistible long before the Harlem Globetrotters got a hold of it.....it just makes you feel good!! Otis Redding's soulful, hip 1968 anthem about heading out to San Francisco. Arranged for brass quintet. You can really create a mood with this blockbuster song! A dramatic, angular, take on this tender jazz classic. This quintessential laid back jazz standard sounds great for brass quintet. Rock out!! This 1960s rock 'n roll anthem is SOLID IN THE POCKET for brass quintet. translates well to BQ, with a classic tango bassline, yearning dissonances, and dramatic surges. in the early 60s. Commissioned by Randy Stroetz and the Med City Brass. Stevie Wonder's tribute to jazz, from his landmark '70s album "Songs In the Key of Life." This is a natural for brass quintet! The very first notes of this great tune reveal its depth and beauty for brass. It burns along at a dance clip, then swings into jazz! Brass Quintet on their CD On the Town (Chandos). Stadium. Piccolo trpt at end (alternate ending has no picc tpt). voice-out shout chorus, and then the train leaving the station. The Ellington/Strayhorn dramatic, tragic song about a bar hopping lush. As performed by the New York Philharmonic Brass at Avery Fisher Hall. Swinging version, with a trad jazz ending. Blazing, swinging ragtime. A show stopper. This haunting classical theme is a favorite of mine. A sweet latin groove for brass quintet. Uses flugels. The shaker (perc) is optional. This light, racing overture from Rossini's opera absolutely sizzles for brass. It's a barnburner. It's a full 7 minutes, but it flies by. As written for the NY Philharmonic Brass Quintet. Five movements. Each movement features a different brass quintet soloist. each member of your quintet! As written for the NY Philharmonic Brass Quintet. (at breakneck speed), for brass quintet! (calls for one and optionally two piccolo tpts). I couldn't resist arranging this great melody. The beginning is reminiscent of bagpipes. The arrangement then dives and climbs, plumbing the emotions of this timeless piece. irresistible tune---humorous, danceable, fun. A real caribbean experience! ("Dreaming") is transcendent for brass quintet. This uplifting tune from the 1920's, done with a bright latin beat! Shaker is optional. There are alternate rhythms provided, so you can find that perfect "lock-in" rhythm. arrangement takes time to develop, so give it a full listen. The climax is dramatic!! Thrill your audience!.....racing trumpets on Mozart's great turkish melody. Virtuosity and power. Piccolo tpt (tpt 1 only) for the second half of the arrangement. assassination of Abraham Lincoln, commemorating the 150th anniversary of that tragedy. trombone (on the Tenor solo).